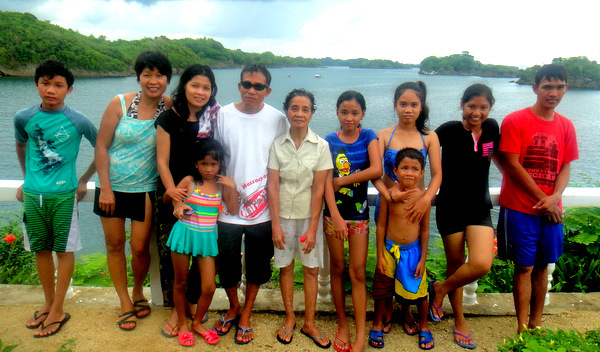 Visited Raymen Beach Resort, located on Guimaras, the sweet mango province where my wife grew up, this past Mother’s Day. We were celebrating the birthdays of two nephews, Sharwen and Jorreal. Since my mother-in-law and sister-in-law, Alida, were in attendance, it was a perfect way to combine the birthday celebrations and also honor our Mom’s. My niece, April, wanted to go on an island hopping tour in addition to swimming and was going to pay for the excursion. 50 pesos, 1.21 US Dollars, per head to rent the pump boat Marvin for one hour. I had no objection to that. Look for the tour operator’s stand at the Raymen Beach Resort if you’re ever at this popular Philippines beach. 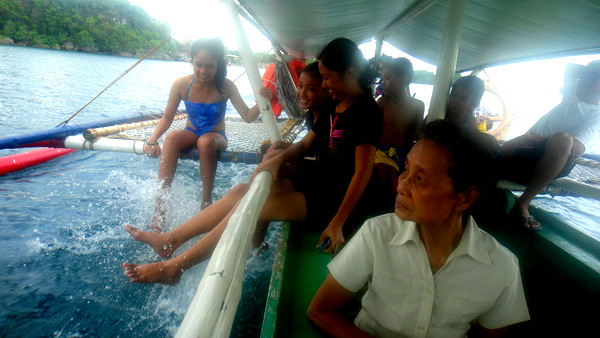 With the 12 people that went on the boat, the quoted price was P600, S14.52, for the hour. Although my niece is no longer employed at TeleTech and has to wait three months for her back pay, she still had cash leftover from her previous paycheck. 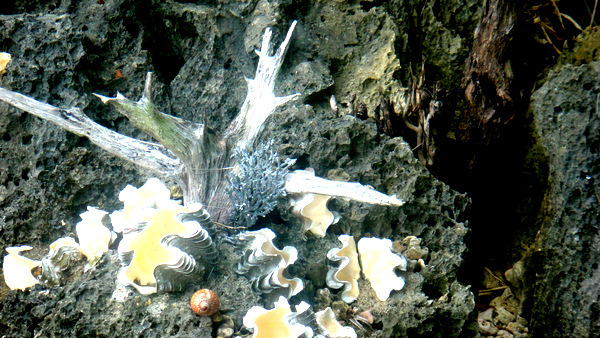 Since her “suitor” Mike had come along, I think she also wanted to treat him, along with the rest of the family, to a special adventure in Guimaras. I stayed behind at the nipa hut we had rented and watched our stuff. It was threatening rain and not ideal picture taking conditions for me. I decided to drink another cold bottle (or two) of San Miguel Pale Pilsen and let my wife and the gang go ahead without me on the hour long excursion. Lola, my mother-in-law, pictured above, was in front. My nieces, April and Den Den, were sticking their feet into the water. Niece Shaina, in the blue swimsuit, who rarely smiles, looks like she was actually having fun and enjoying herself. The photo above was taken by the official staff photographer for Philippines Plus, my asawa. This rock formation is on a beach called Ave Maria. 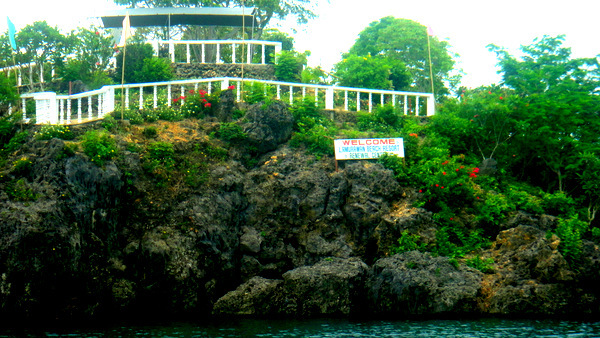 The hour long tour consisted of island hopping to four different locations and spending approximately 15 minutes at each. We’ve already been informed by our five-year-old-niece JalAmiel that she wants to go island hopping for her birthday. Amiel had a great time on this trip and knows Uncle Dave and her Tita Daday (my wife) will grant her this birthday wish. 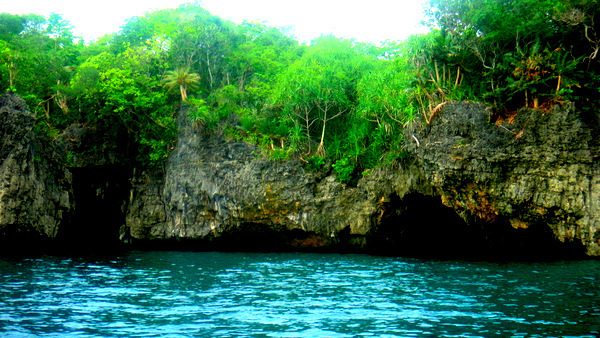 This is the entrance to Baras Cave where my mother-in-law told my asawa that residents of Guimaras hid during the Japanese occupation of World War II. The Philippines was a dangerous place to live during that terrible time and the mango province was no exception. The cave made a good hiding place. 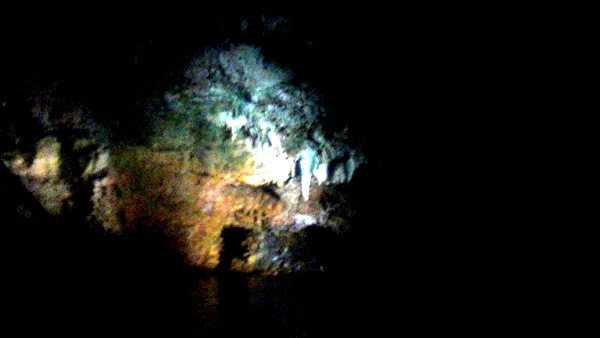 My asawa had her trusty Sony CyberShot digital camera and took many pictures inside of the cave. Some of the photos were too dark to publish in this post. She tried to adjust the flash setting to no avail. In the future, the CEO of Philippines Plus might spring for a better quality camera for future stories. But my spouse did a good job with the equipment she had available. 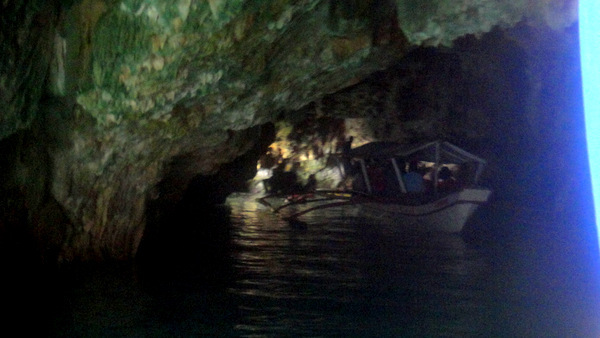 Another look at the inside of the cave on the Guimaras island hopping tour. I loved the textures and the colors of this picture my spouse took near the entrance to the Baras Cave. Next up is niece Shaina, putting the “cute” pose on Jorreal. Poor kid looked like he was ready to cry. April and Noy Noy, our neighbor from Iloilo, are next to Shania. Mike took the photograph. 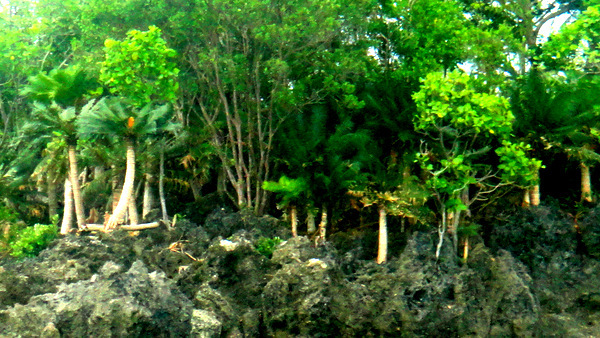 A view of one of the islands from the pump boat Marvin. Though a downpour greeted my wife, relatives and friends later in the tour, it didn’t damper their spirits for this adventure in Guimaras. Meanwhile, I was passing time at the Raymen Beach Resort having another cold one. 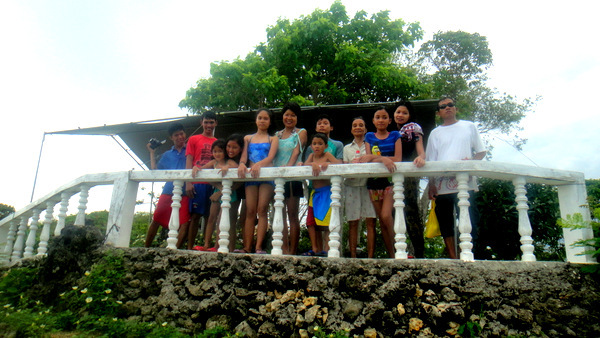 The island hopping tour included a stop at the Lamurawan Beach Resort and Renewal Center of the Estoy-Gedalanga family in Guimaras. My asawa informs me that the center is operated by nuns. The crew poses for another group picture at the sanctuary in the photo above. 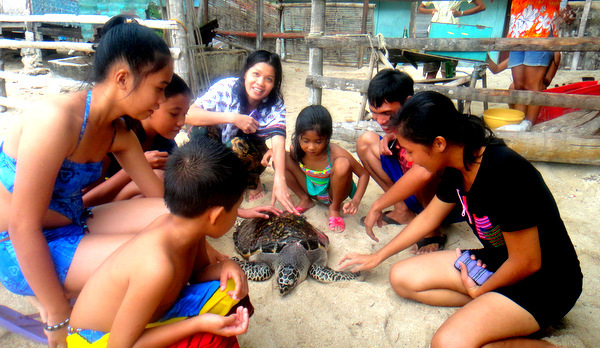 Another stop on the island hopping tour was Lusay beach in Lawi, Jordan, Guimaras, and home to the Lawi Turtle Recovery Center. 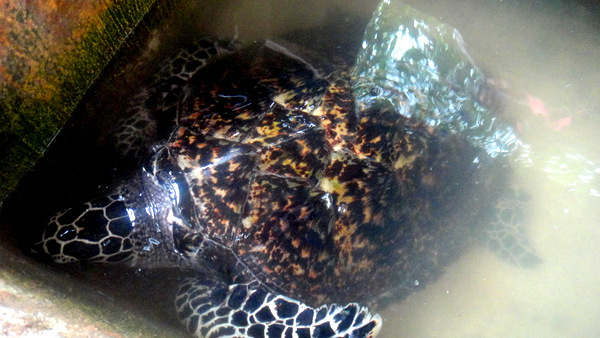 This is one of the turtles the island hopping crew encountered. My wife grew up in this area and told me some students from Santa Theresa High School in Guimaras, which my asawa also attended, had drowned while swimming at the beach nearby. The kids were celebrating their high school graduation and decided to go for a swim. Suddenly one of the students called out for help! He was drowning! A classmate dived in and attempted to save his friend. Sadly, both of them drowned. The tragedy occurred many years ago while my wife was still in elementary school. Some residents blame the unfortunate incidents on a witch that lived near the beach. It’s reported that the witch put a spell on the students which caused them to drown. My asawa doesn’t know if the witch is still alive but she tells me that many people have drowned while swimming here. 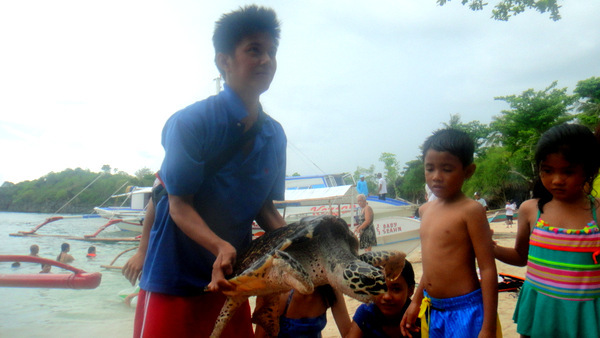 On a lighter note, here’s my nephew Jorreal petting the turtle. His sister JalAmiel is looking on. Amiel was content to look at the creature, but it doesn’t look she was inclined to touch it. 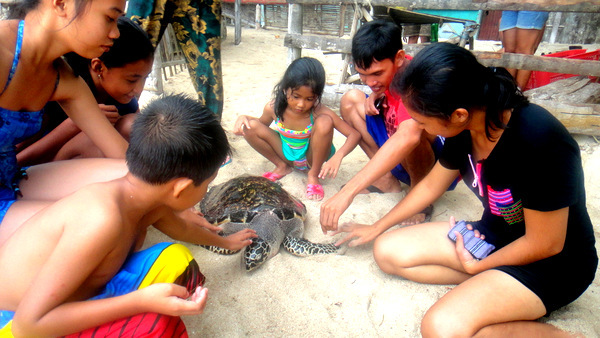 Shaina, Alida and April had no qualms about petting the turtle. Amiel continues to look on. Mike is showing off to April as Jorreal and JalAmiel check out the turtle. 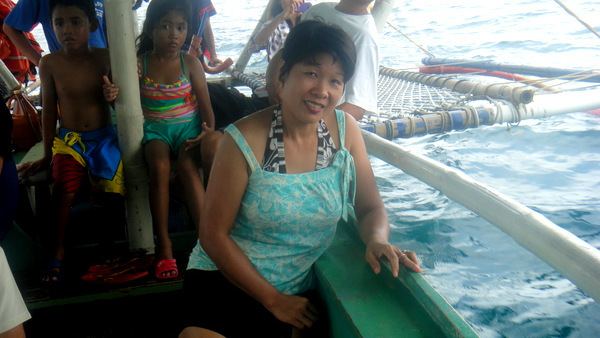 My lovely asawa, shown above, enjoyed the cruise. She had a great time on this adventure and discovered a new beach where the family can go swimming. It’s a private beach but my mother-in-law is friends with the owner and we’ve been given permission to go their next time we travel to Guimaras. The house in the picture above can be rented for vacations when visiting the island. A good secluded spot for fun and recreation. 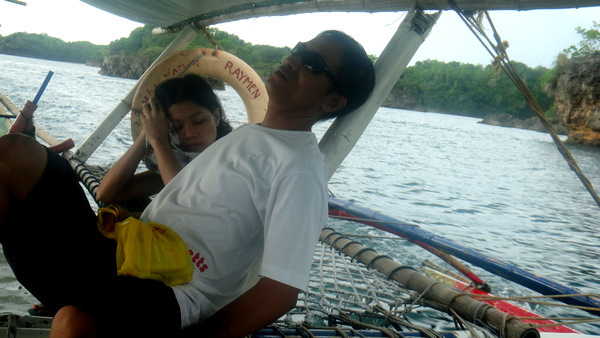 Getting away from the big city, Iloilo, and going on this excursion, gave my asawa a well-deserved break. We’ll have to check out the rental on this place in the future. 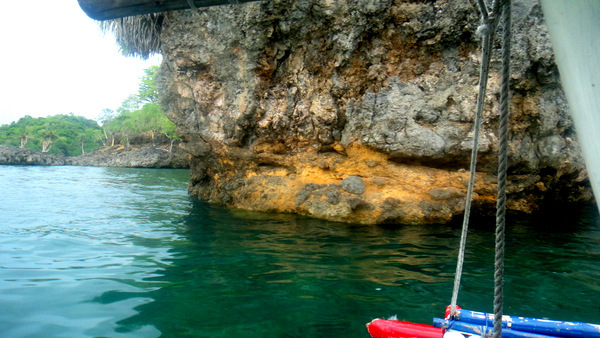 The island hopping tour lasted over an hour and ended up costing April 800 pesos. Looks like it was too much for my sister and brother-in-law, however, as they took a snooze on the way back to the Raymen Beach Resort. With three kids to raise, I’m sure they needed this nap. I’ll be joining the crew on their next adventure. They had tons of fun and everyone thoroughly enjoyed themselves. We’ll be sure to pack a few bottles of San Miguel in the cooler, along with the Coke and Sprite, and some of my asawa’s delicious fried chicken. Retirement in the Philippines. It can’t be beat! Thanks for sharing your pictures. I miss being their sooo much, just got back from their about 2 months ago, and am wishing I was still their. I have traveled a few places in my life, but the Philippines is the most beautiful place (people and scenery) I have ever been too. Its also the only place I ever had a desire to move too one day. You have quite a good looking family Dave, am sure you are quite proud of them all. You’re welcome, Bill, glad you liked the pictures. Hope you can make it back here some day. There’s nothing else quite like the Philippines, that’s for sure. Thanks for the kind words regarding the family and take care. No doubt, I’m a very fortunate guy, PapaDuck. I hated to miss the tour but I’ll be sure to make it on the next one. 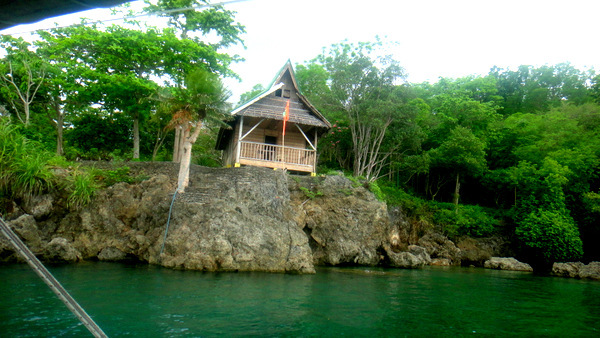 My brother-in-law Joery was going to stay behind and watch our rented nipa hut. Glad he took my place. He needed the rest more than I did. The Island Hopping tour looks like great FUN ! I would love for our weather to turn cooler, Don, I’m waiting for the rainy season to start. These hot weather summer months are my least favorite. I have no posting schedule as such which goes against the advice of what most websites about blogging advise. But regular readers know that I march to the beat of a different drummer. Sometimes I have stories in the can ready to be published. All I have to do is literally push a button and a new post goes to the internet. Other times, I might wait a four days, a week, or in some cases longer than a week. Naps? I took them back in the States but rarely take them here. Too hot even with a fan and I’m too cheap to turn on the air con for one, Don. I save that for the evening. Thanks for the comment and take care. A tour for PHP800??? What a bargain!